Let’s come back home. The above are lessons for Ethiopia too. The Woyyanes created The Oromo Peoples’ Democratic Organization (OPDO) from prisoners held in Eritrea to control the Oromo people, Amhara National Democratic Movement (ANDM) was created for the same puropose mainly from Eritreans born in Ethiopia like Bereket Simon, Tadesse Tinkishu, Tesfaye Gebreab .. for the Amhara people , the South Ethiopian Peoples’ Democratic Movement, again mainly from prisoners of war to control the Southern. Then out of these house of cards the TPLF formed what it called The Ethiopian Peoples’ Democratic Front (EPRDF), the masters being The Tigrean People’s Liberation Front (The TPLF). For the last 27 years, these were untouchable Mafiosi group that ransacked the country, controlled the people down to 5 people to one. They went on killing and imprisoning spree whoever did not accept their ways of ruling the country. Change from the outside, be it peacefully by force became impossible. Some picked up guns and started fighting back. There have been popular uprising in the Oromo and Amhara regions. The worst nightmare of the TPLF came when Gondare’s came out in Unison and declared that the blood that is being shed in the Oromia region was Amhara blood! The era of divide and rule started crumbling. The Oromos responded with the same tone claiming that the bloodshed in the Amhara region was Oromo’s blood too. The house of card of Woyyane started crumbling. 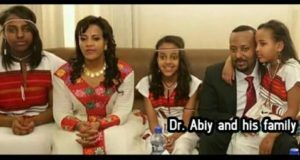 The TPLF’s spokes person lost his mind and was filmed screaming that their homework was not done properly, otherwise how could fire and hay get on so well, in Amharic. In the mean time, the old prisoners of war became too old and the new generation started replacing them within EPRDF. It was Yared Hailemariam who had pointed out that a change could come from within EPRDF way back in March 2016. This was evidenced sooner than later, when Lemma Megersa of OPDO made an official visit to Bahir Dar. We started hearing amazing statements, OPDO defending Ethiopia on Amhara soil. We all were taken aback by the statement we heard from this young Oromo leader. Then we heard, he had a team that included Dr Abiy Ahmed Ali. These young Oromos came talking about the unity of Ethiopia. Anyway, que sera sera! Whatever will be, will be!